Finally we seem to have reached a pause point in the gold spot price, with yesterday’s price action ending the trading session as a small doji cross candle, suggesting that we may see a short term reversal lower, which indeed seems to be the case in early trading this morning. 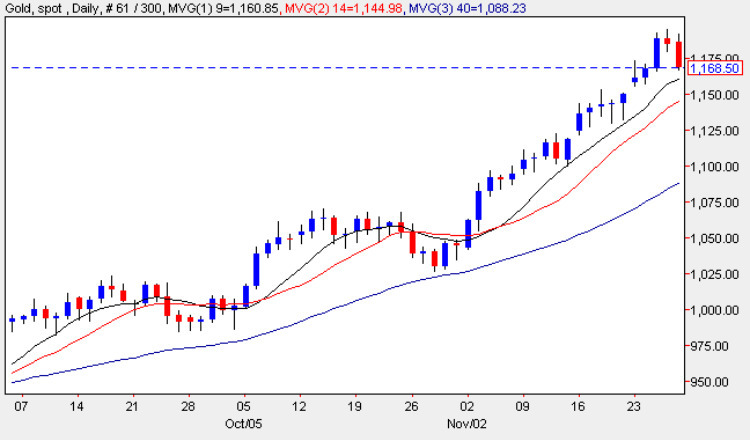 However, given that yesterday was a holiday in the US, with thin trading volumes as a result, the pause point came as no great surprise, and with all three moving averages pointing sharply higher, there is little cause for concern at present on the daily gold chart, with any reversal lower seen as an excellent buying opportunity for new trading positions. Any short term reversal lower is likely to find solid support from the 9 or 14 day moving averages, and will probably be limited to the 1,150 per ounce price level where the minor support level awaits. With the weekend ahead the pullback may also be a result of traders squaring positions ahead of the two day break, as they take some profits off the table before building further long term positions next week. From a fundamental perspective the demand for gold appears to be accelerating which according to today’s FT, has forced the US govt to suspend sales of the world’s most popular bullion coin, the American Eagle, after running out of inventories. This is second shortage since the start of the financial crisis back in August 2008. “The US Mint has depleted its current inventory of 2009 American Eagles one-ounce bullion coins due to the continued strong demand,” the mint said in a statement late on Wednesday. It added that selling will resume “once sufficient inventories . . . can be acquired to meet market demand”. According to official data so far this year the US Mint has sold about 1.19m ounces of American Eagles, up almost 75 per cent from the same period last year and on track to be the highest annual volume in ten years. Sales of American Eagle’s silver coins have hit 26m ounces, the highest level in at least 23 years. The fundamental picture is further reinforced by the central bank of Sri Lanka, the latest central bank to add to is gold reserves.